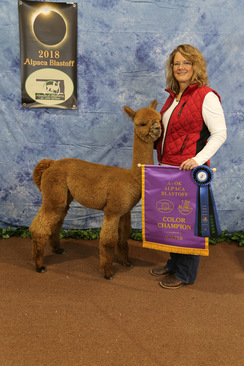 Troubadour won Color Champion in his first show at only 6 and a half months. That in itself is an accomplishment, but even more impressive is the fact that Troubadour beat other multi-banner winning males. Not to mention, the judges gave him a second look in the Judge's Choice circle and although ultimately deciding on a lighter, older male the judges gave Troubadour kudos during their oral commentary.